I originally had this over in the "look what I made" subforum, but since it's corexy, it is probably of more interest over here. I am working on a sand table project for the Milwaukee MakerFaire that will be held at the end of September. The table will be 1.9m x 1m so that's how big this mechanism is. I decided to use cables because I haven't done it before and this is a relatively forgiving application. Also using cables allowed me to maximize printed content (yes, me!) in the mechanism. I designed, printed, and tested a set of parts, didn't like the way it worked, so I redesigned it. It seems to be acceptable now, though I am still testing, and have yet to test it with any sand. The mechanism consists of 2x motor mounts, 2x Y axis pulley blocks, 2x corner pulley blocks, and a magnet carriage. 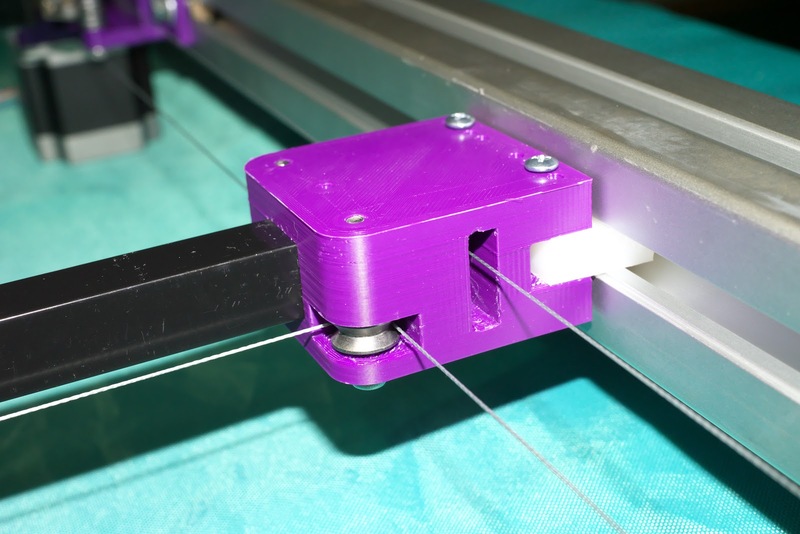 The X axis is a piece of 16 mm square aluminum tubing, and the Y axis uses the t-slots in the frame for guidance to avoid the expense of linear guides, etc. The original design used a simple drive pulley that the cable walked up and down and overlapped itself, making plinking noises as it moved and probably interfering with smooth motion, too. The rev 2 version in the photo uses outboard steering pulleys to guide the cable and prevent it from walking up and down the drive pulley and overlapping itself. No more plinking noises, but now the noises from the cheesy steel pulleys are bothering me. The white piece is UHMW PE used as a bearing. It is cut to fit in the 10mm wide slot in the frame. The corner pulley blocks are mirror images of each other. I generated two stl files in CAD using the CAD mirror function, but you can use the mirror function in Cura to print the second block, too. The cable is 90 lb test dyneema fishing line, the magnet is 1" cube N52 neodymium (crazy strong), and the steel ball will probably be 15 mm in diameter, possibly larger. I connected it to the smoothieboard I recently pulled from UMMD, added a couple homing switches, and ran some tests at much higher speeds than I will be able to use when the ball is pushing sand around. Interesting, so just 3 wraps on the drive pulley is enough to stop it slipping? I ask because dragging a ball through sand is going to be quite the side load compared to a printer. Edited 1 time(s). Last edit at 08/04/2018 12:31AM by Diggrr. No more plinking noises, but now the noises from the cheesy steel pulleys are bothering me. I felt the same when I saw the video, but on the MakerFaire people won't hear it. I'm still testing on the slipping using settings that are somewhat unrealistic- acceleration is 3000, junction deviation 0.1, sped 200 mm/sec. In actual operation is will probably be running at about 20 mm/sec, acceleration 300, and junction deviation 0.05 or less. At 20mm/s, how long will it take to draw one picture? Edited 1 time(s). Last edit at 08/05/2018 02:43AM by o_lampe. The time is also partially a function of the "extrusion width" = ball diameter. I may erase patterns manually by opening the top and sliding a leveling board across the surface, or just set up a sequence of patterns that alternate starting and ending points at the center and edge of the table. That way each new pattern will just overwrite the old, and the old pattern will be the "background" for the new pattern as it is being drawn. Motor mount rev3 is done and tested. No slip. Period. This one uses 3 steering pulleys and 4 loops around the drive pulley. I kept the geometry the same as the rev 2 motor mount so the rest of the parts still work with the new drive pulley and steering pulley positions. There's sideload to the stepper bearings. Would it be possible to place the single pulley to the opposite side? Maybe add another pulley if need be? Or place one pulley on each of the motormount screws? Edited 2 time(s). Last edit at 08/06/2018 12:59AM by o_lampe. If I used belts the motor bearing would be side-loaded, too. That's the normal way of operating motors, though I suppose if there were an equal number of steering pulleys on opposite sides of the motor you could shift the load from the motor bearings to the steering pulleys. But the crappy little steering pulley bearings are not as capable of handling the side load as the much larger motor bearings. If I were going to build this mechanism to last, I'd definitely use much better steering pulleys/bearings. I like the idea of using the motor mount screws to also serve as axles for the steering pulleys. That would be a neat looking arrangement! I agree the sideload issue is not important, although a cable driven system needs more tension than a belt. The cloverleaf arrangement might offer a better cable wrap ratio if done right and thereby reduces the required tension. How about calling it 'Cloverdrive'? I made two sketches and found, the crossed version has more than 360° wrap which might wear out the cable too fast. Edited 1 time(s). Last edit at 08/08/2018 12:41AM by o_lampe. I took all the pieces to the makerspace over the weekend and set it all up again on what will be the final frame. I was there again last night and ran the mechanism for a few hours and found a couple of the crappy little pulleys getting wobbly and noisy, and finally, one of the drive pulleys self-destructed. I had printed them with 20% infill, so I am reprinting them in 100 um layers at 40% infill with 2 mm wall, top, and bottom thicknesses and will install them and replace the noisy pulleys in a couple days. Someone at the makerspace thinks he'll have time to cut a couple of the drive pulleys on a lathe out of aluminum rod stock. I may switch the whole thing over to belt drive. It will be a lot more reliable. Still deciding on the medium to use. Clean white sand is not so easy or cheap to come by, but Harbor Freight Tools has Sodium Bicarbonate blasting medium in 50 lb bags, and the stuff is very white. After the makerfaire we can use the "sand" in the sand blasting cabinet at the makerspace. I can't recommend sandbox sand, it is often mixed with clay. One of the materials I am still considering is clay cat litter. It's very cheap, uniform size grains, though maybe a little larger than desirable. I happen to have some so I'm going to test that today. If you clay doesn't work, you could use zeolite also, it is available in different grain. The sand-blasting stuff sure is very abrasive and probably noiser than the average sand. I ran a couple tests yesterday. Clay cat litter is out. It is dusty and it doesn't really form ridges when the ball moves through it, and in fact, the ball just buries itself in it and rolls around under it. It's an interesting effect, but not what I'm after. I also tried some kitchen type baking soda. Great! Pure white, no dust, and it compacts as the ball moves through it leaving behind nice ridges and a very smooth trail. I need to take a look at the blasting medium to see if it will be usable, otherwise I can order a 50lb bag of the kitchen type stuff. diatomaceous earth is fine, white and doesn't clump. Get the garden variety, much cheaper than food grade. I'll look into that. Someone at the makerspace was suggesting some material that is used in glazing pottery. So many choices! 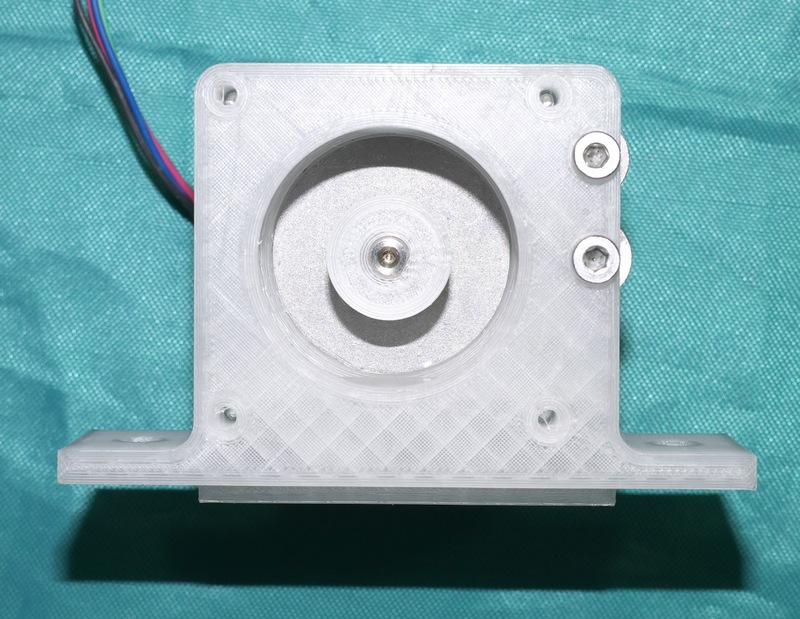 I installed new drive pulleys that I printed solid. They fit very tightly- I had to hammer them onto the motor shafts. If they or any other parts fail in the next few hours of testing, I'm going to convert the whole thing to belt drive and be done with it. I still have a lot more work to do to finish the whole thing and the clock is ticking. I don't think I'll be doing any more cable driven projects. If you want to try something new, mix belt and cable. Belt only where needed to fight slip and cable for the rest. ( ~50:50 ). 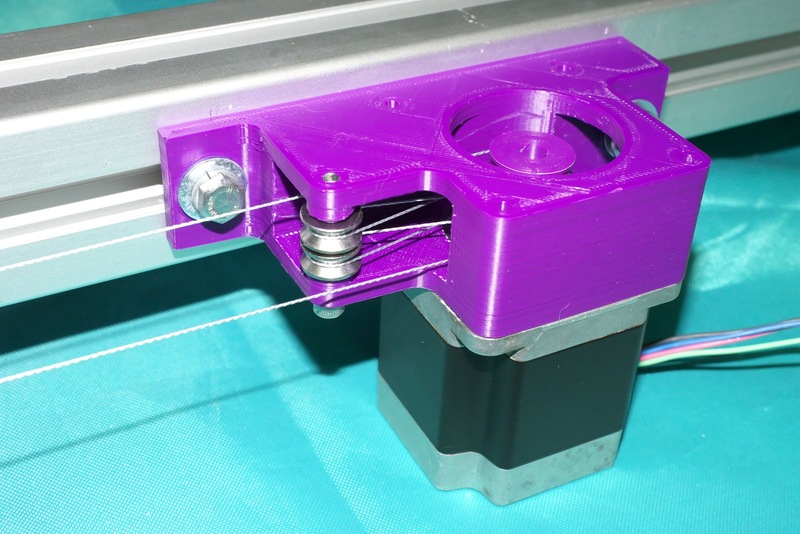 I did that on my Kossel XL Delta and it reduced ringing a lot. Edited 1 time(s). Last edit at 08/16/2018 01:06AM by o_lampe. I have decided that I distrust the crummy cable pulleys too much to use the cable driven mechanism. If anything goes wrong, it will be a nightmare to remove 50 lbs of baking soda and restring the cables, especially with 30k people walking around and asking questions while I'm trying to do it. I have redesigned the mechanism for belts. Parts are on the way, and other parts are being printed. 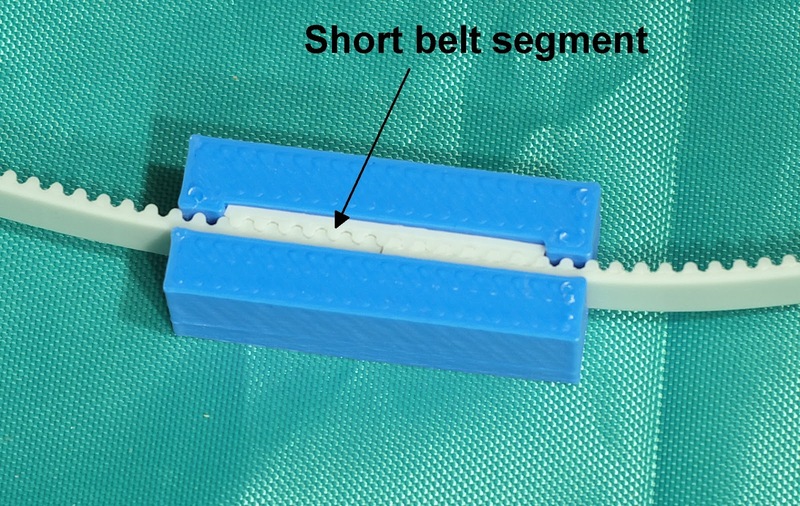 The belt design copies the cable design - both belts on one layer, and they will twist/cross at the back of the mechanism. 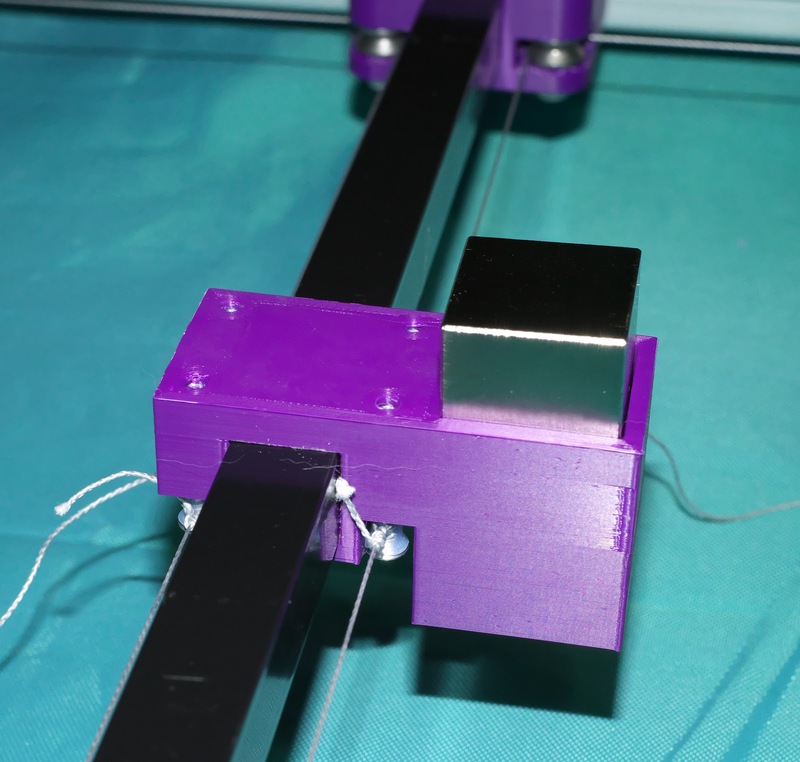 The corner pulley blocks will be anchored to both the X and Y frame members in the corners and all belt tensioning will be done by sliding the motor blocks back along the Y parallel beams. 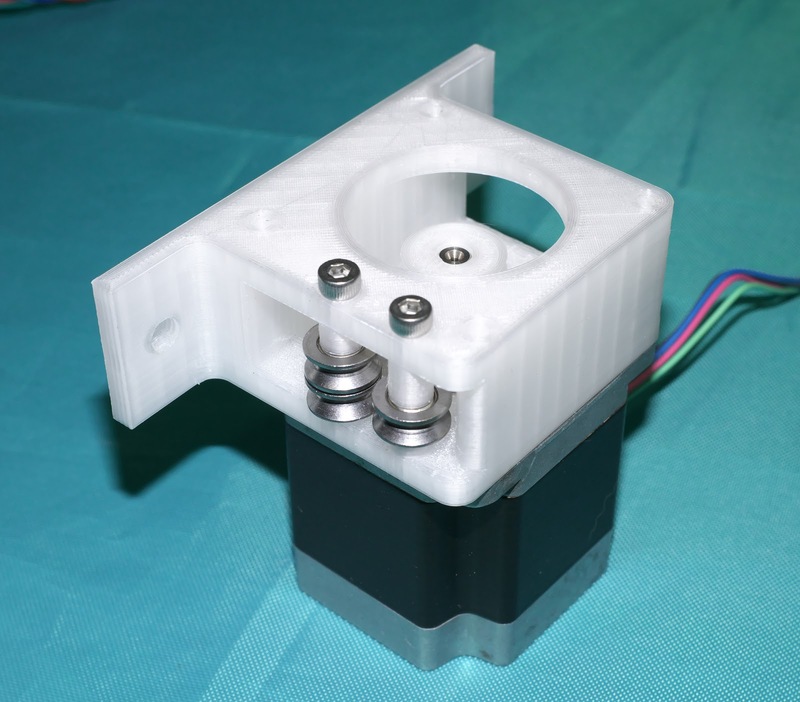 I copied the design of the belt clamps for the magnet carriage from the design I used in the Z axis of UMMD. The only worry now is whether the belts will sag enough to come off the pulleys. Let's hope tension and small flanges are sufficient to keep then where they belong. The belt drive conversion is done and working well. No more noisy pulleys and no more worrying about slipping or knots coming untied. 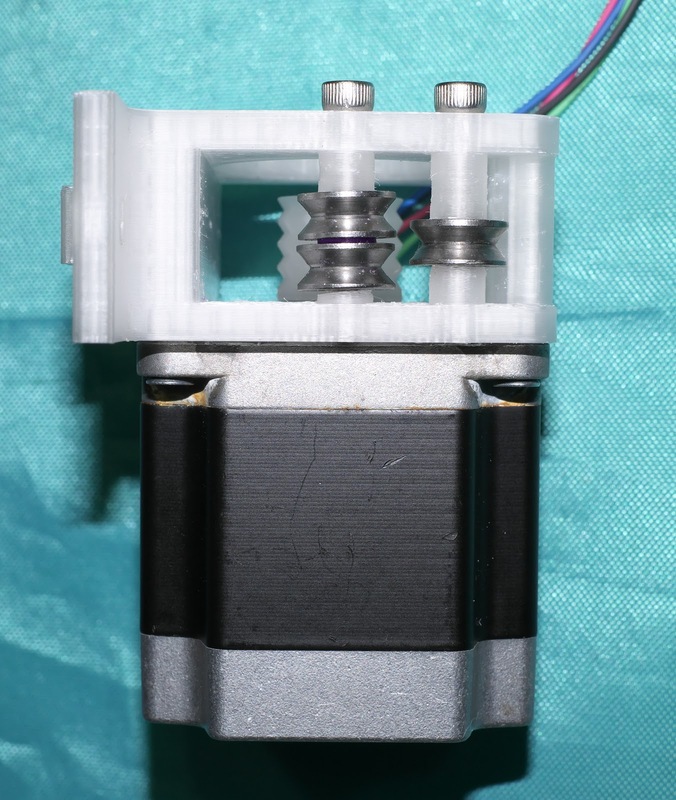 The mechanism is essentially the same, but with belts instead of cables. 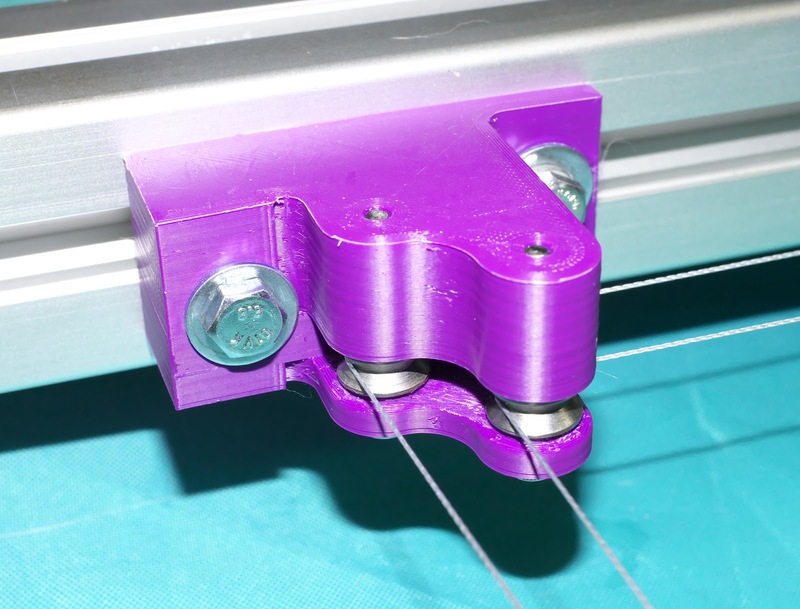 The belt clamps on the magnet carriage are perfect, and it was very easy to string the belts and tighten them up and align the mechanism. I'll be working on the rest of the mechanism over the next week or so. I figured out a good way to make the table so that it will be easy to access the mechanism if I have to, yet make it difficult for dumb people or kids to do dumb things. The base/mechanism will have legs attached, and will stand by itself. 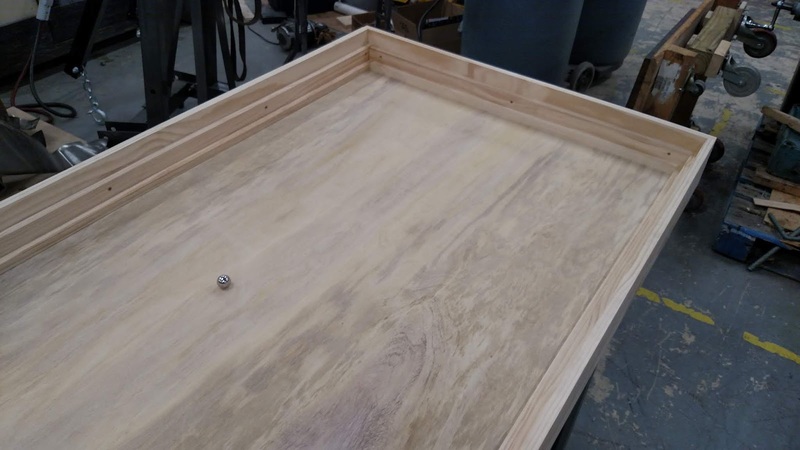 The table surface will be 1/2" plywood that has a wood frame around it. It will be a little larger than the base and will fit over it. The cover is the same size as the base and will drop into the table surface frame. So they are just stacked. 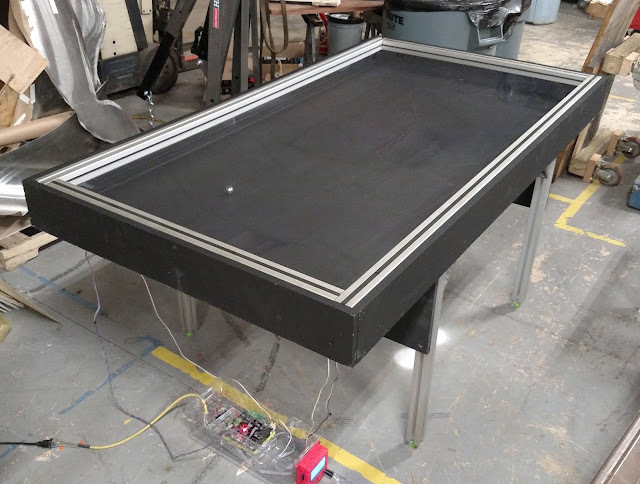 Removing the cover gives access to the sand, lifting off the table surface and its frame will give access to the mechanism without having to first vacuum up the sand. Usually they use a bandsaw to cut a huge pile of textiles at once. I don't think a laser can cut more than one layer without melting them together. The table construction is just about finished- I'm going to seal it with silicone and then paint it. I was working on it at the makerspace today and about 5 people came over and played with it for about an hour, throwing every piece of metal they could think of on it to see what it would look like getting dragged around by an unseen magnet. They were like a bunch of cats. When the MakerFaire is over, I'm going to take the thing home and see if my cat will enjoy it as much as the people at the makerspace did. I'll take the medium out and just let the cat walk around on the wood. She can chase different metal objects, or objects with metal or magnets inside them. The table has been painted black and a corrugated cardboard cover placed over the bottom side of the mechanism in case some kid or dope sticks his hand under there. Next up- install LEDs and run some tests with media. I've seem some very nice sand tables with RGB-LED's all around. A bit too bright for my liking, but a stunning difference to 'bright white'_only LED strips. I'm planning on using fixed red and blue LEDs because I don't want changing colors and flashing lights to distract attention from the patterns in the sand. My calculations indicate that a single 50 lb bag of baking soda should cover the table to 1/2" deep. I'll be picking the stuff up at Harbor Freight Tools tomorrow if they have any in stock. I have a 25% off coupon, so $30 will buy the bag. Edited 1 time(s). Last edit at 09/02/2018 11:48PM by the_digital_dentist.